What happens when four farming mates gather on the main oval at the show, armed with a stack of hay bales and fencing wire? Find out at the Young Farmers Challenge event which returns for its second year at the 2017 Jamestown Show this weekend, sponsored by Ignition Custom Engineering. The event is designed to showcase the everyday skills, equipment and techniques used by farmers in series of fun and competitive challenges. Working in a team of four, each group is timed to see who can complete the tasks the fastest and with the most precision. Putting up portable livestock fencing in a hurry is not as easy as it looks! Last year’s event winners took home the glory of the event title and shared in a cash prize provided by Ignition Custom Engineering (who will also be hosting a trade site again at this year’s show). Gunsmith Nik Halliwell said his team was proud to sponsor and take part in this year’s event again. 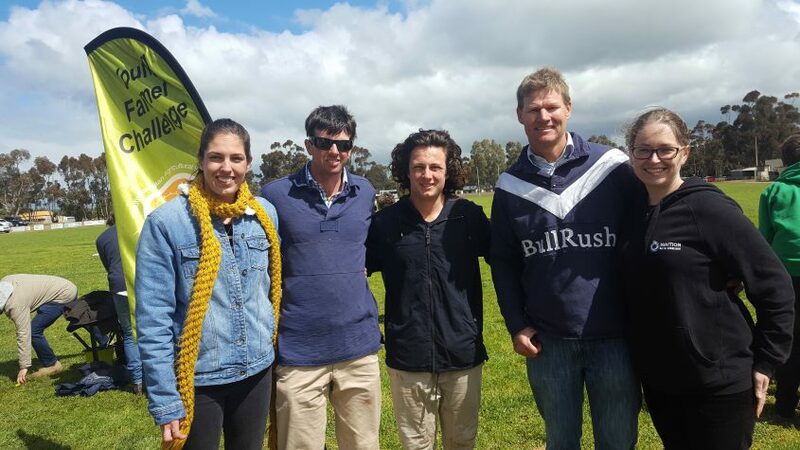 “It’s important to support local rural communities; they are the lifeblood that supports our country and this event is a fun way to celebrate the skills, spirit and humour of country Australia,” Nik said. Challenges range from sheep drenching or dirt removal, hay stacking, setting up a portable electric fence, stitching bags chaff to mending a pair of pants – while still wearing them – and kicking a footy. “One of our favourite moments last year was watching grown adults, fired-up by fierce competition, running across the showground oval…..after downing a massive jug of iced coffee,” Nik said. “They did us proud and all kept their composure, mostly”. This stage required downing an iced coffee before running across the oval – what could go wrong? Entries are open until the start of the event and can be placed on the day or in advance with Jamestown Agricultural society by contacting Maryanne on 0429436633. “So come on down with some mates, enter a team in the challenge if you haven’t already and say G’day,” Nik said. Young Farmers Challenge: Some teamwork required.